It's two of my favorite days wrapped into one!! Hexie Linky Party and Feline Friday!! Bonus - can you believe that HeLP is 6 years old today?? Yipp! It was started on 8/17/12!! In that vein I will send a little gift to a drawing winner. I just realized the linky-versary as I am typing this so I don't have the prize well thought out yet but I'll update the post with a picture next week. RULES: Anyone that links is in the drawing. Since it's HeLP and Feline Friday, you can link once for hexies and again for felines, for 2 chances. Links must go to a specific post and not your blog in general. Posts must contain English Paper Piecing and or your cats. Links not following the rules will be removed from the linky party. Thanks for playing along!!! I did receive some assistance. 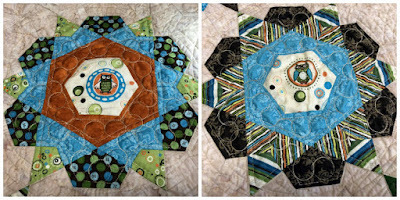 The quilt has been mostly quilted and bound for a year but the dense curves meant I needed to add more quilting to the rose stars. I used "rulers" to add circles. I didn't take a final closeup pic but I also did a couple circles around the owl in the centers. I have yet to figure out how they choose which quilts to hang open or folded at the fair. My owls must be napping as the quilt is hung sideways. It's hard to see in the picture but I did get a blue ribbon on this and my other 2 quilt entries. One of which is the red/white in the bottom left. Congratulations on the ribbons. I love seeing your helper. Just gorgeous finish! Which fair? I am taking the grands to the Erie County Fair tomorrow. Hope to see the quilts. Oh, great job Sarah, winning all those blue ribbons! Your owl quilt looks so good--of course, we can credit your expert helper with monitoring quality.